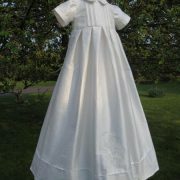 New for Spring 2011 is a delightful christening gown, created specifically to celebrate the heritage of Scotland. 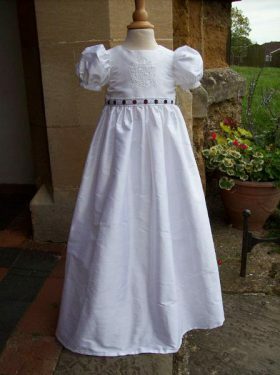 Little Doves has created a simple silk dupion christening gown and decorated it with a beautiful hand embroidered thistle on the skirt front. 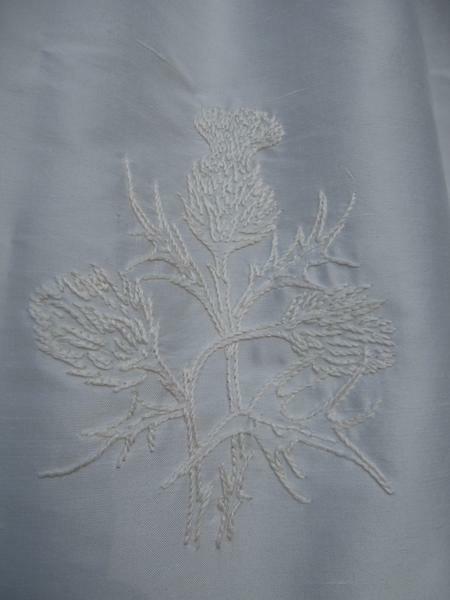 The first use of the Thistle as a royal symbol of Scotland was on silver coins issued by James III in 1470, however the prickly purple thistle was adopted as the Emblem of Scotland during the rein of Alexander III (1249-1286). 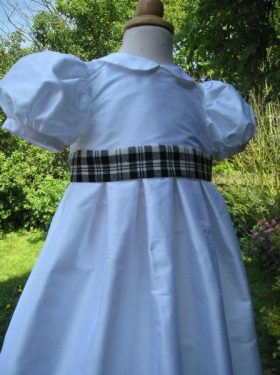 Legend has it that an Army of King Haakon of norway, intent on conquering the Scots landed at the Coast of Largs at night to surprise the sleeping Scottish Clansmen. In order to move more stealthily under the cover of darkness the Norsemen removed their footwear. As they drew near to the Scots it wasn't the only thing hiding under the cover of darkness. For one of Haakon's men unfortunately stood on one of these spiny little defenders adn shrieked out in pain, alerting the Clansmen of the advancing Norsemen. Needless to say the Scots won the day. 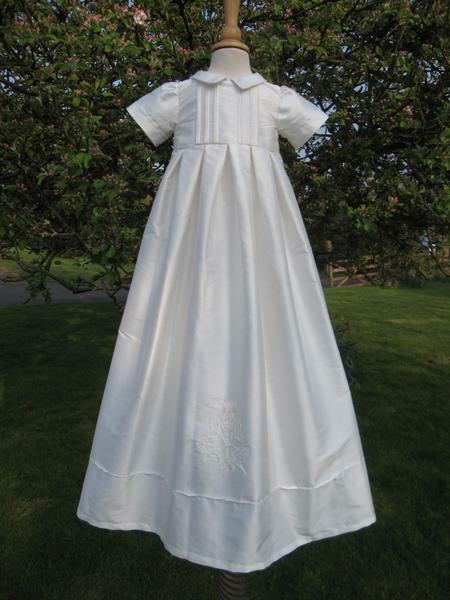 The Thistle Christening Gown has simple lines, the bodice is decorated with vertical stripes of pintucks and satin ribbon. 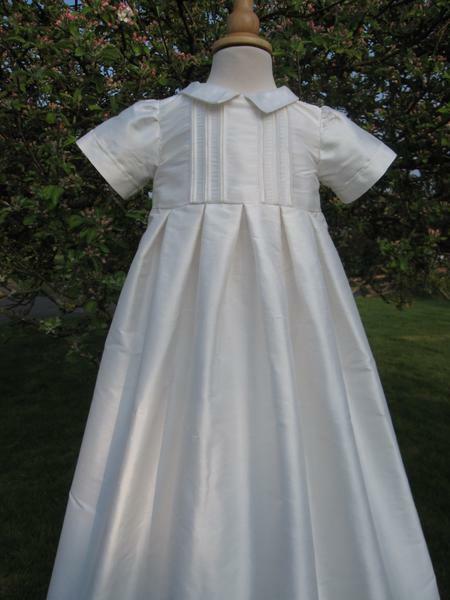 Short cap sleeves have pintuck detail and a small collar compliments the style. 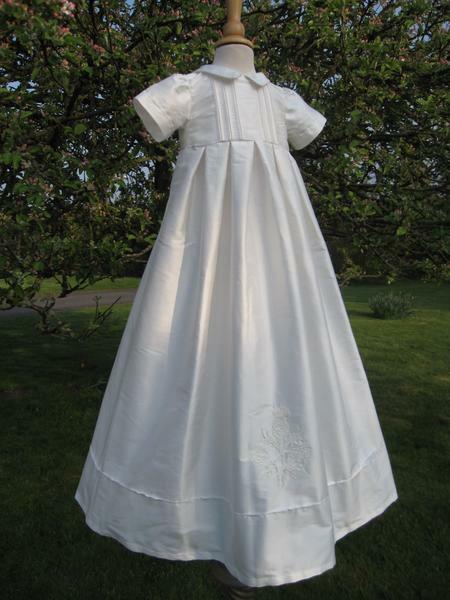 But the beauty is in the skirt. 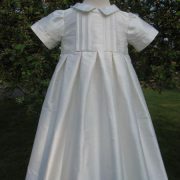 Pleated at the waistband, the skirt falls away to the hemline with its pintuck detail. 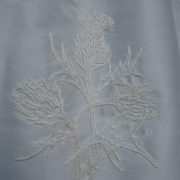 In the centre of the skirt is a delicately embroidered thistle. 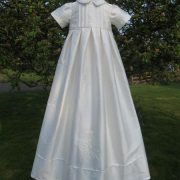 Embroidered by hand, a variety of stitches have been used to ensure a realstic feel to the gown. 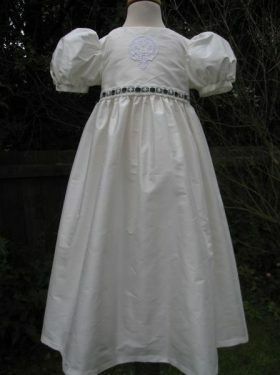 This is a truly wonderful gown, full of heritage and meaning. 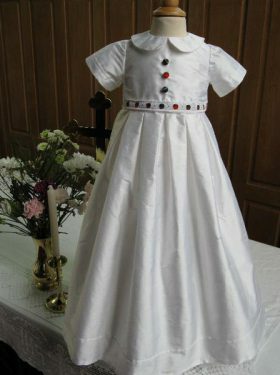 Matching caps, bonnets, bibs, booties and silk shawls are also available to create the full ensemble.